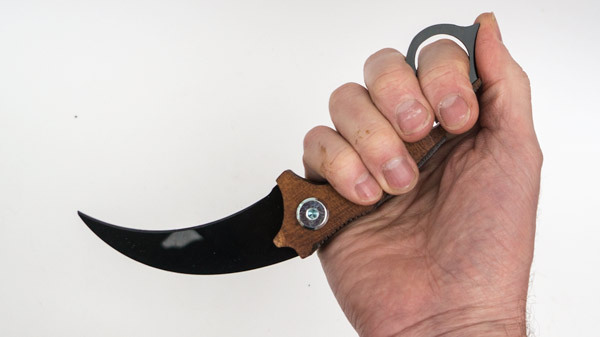 Originally from Indonesia, the karambit is a handheld knife whose design is said to be insired by the cat’s claw. The karambit features in the popular computer game Counter Strike. I made this cosplay karambit knife for #1Son. 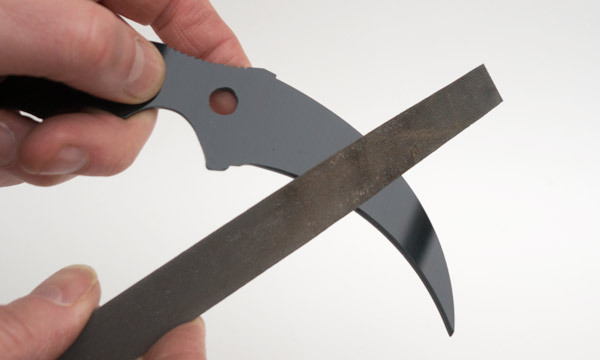 The blade is made from black acrylic sheet and the handles from 6mm plywood. 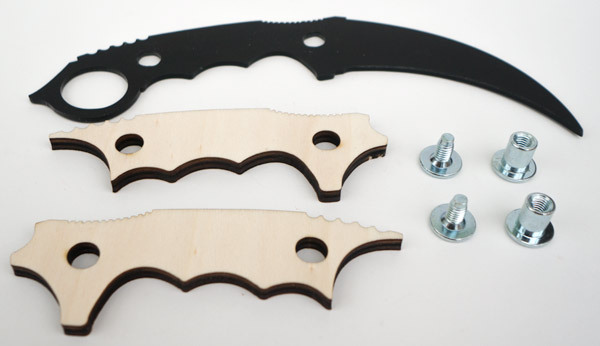 The parts are cut out on a CNC laser cutter. 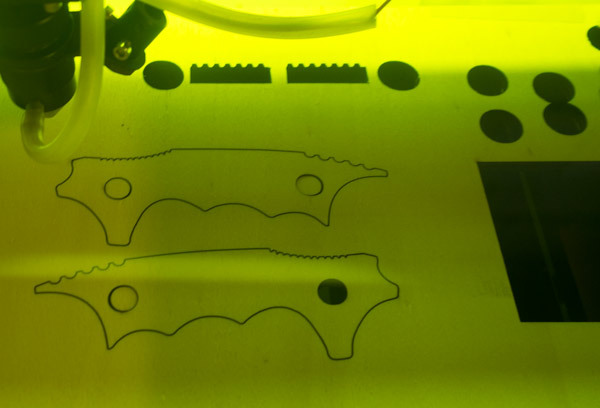 Viewed through the tinted window of the HPC3050 laser cutter, the handles of the karambit are ready to pop out of the 6m plywood sheet. The blade is cut from 3mm thick black acrylic. I purchased the cross dowel nuts & bolts from Screw Fix in the UK. They are both M6 x 12 size. Parts numbers in the Screwfix catalogue (UK) Bolts 88785. Nuts 83501. As the knife is for cosplay not for actually killing people, I have not sharpened the blade, that said, I did put a small chamfer on it with a half round file, purely for looks. 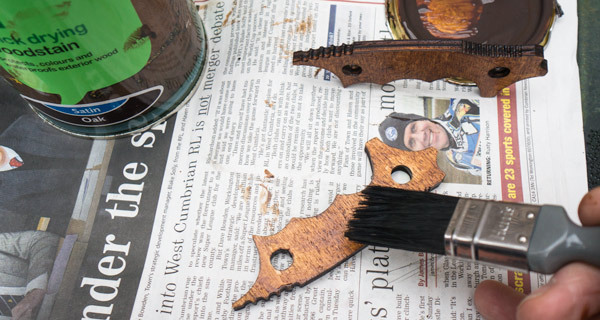 A couple of coats of woodstain seals the handle pieces. 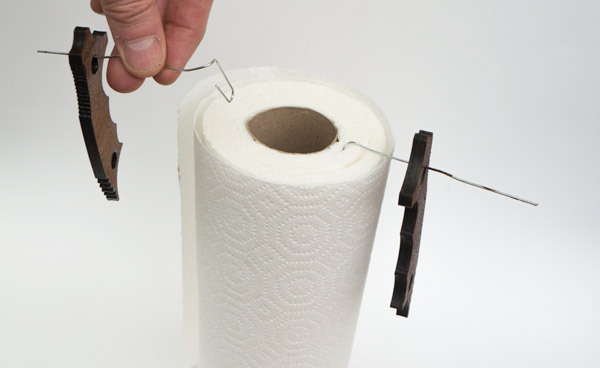 Paper clips and a roll of kitchen paper make an excellent stand for hanging the handles out to dry. Give them a few hours to dry completely. And there it is. A thing of chilling beauty. #1 Son tells me that you hold it like this. Wooarghhhh!